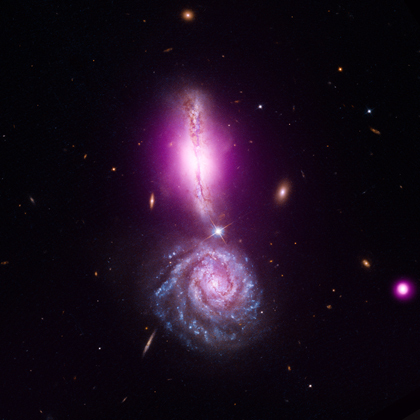 VV 340, also known as Arp 302, provides a textbook example of colliding galaxies seen in the early stages of their interaction. The edge-on galaxy near the top of the image is VV 340 North and the face-on galaxy at the bottom of the image is VV 340 South. Millions of years later these two spirals will merge - much like the Milky Way and Andromeda will likely do billions of years from now. Data from NASA's Chandra X-ray Observatory (purple) are shown here along with optical data from the Hubble Space Telescope (red, green, blue). VV 340 is located about 450 million light years from Earth. Because it is bright in infrared light, VV 340 is classified as a Luminous Infrared Galaxy (LIRG). These observations are part of the Great Observatories All-Sky LIRG Survey (GOALS) combining data from Chandra, Hubble, NASA's Spitzer Space Telescope and Galaxy Evolution Explorer (GALEX) and ground-based telescopes. The survey includes over two hundred LIRGs in the local Universe. A chief motivation of this study is to understand why LIRGs emit so much infrared radiation. These galaxies generate energy at a rate this is tens to hundreds of times larger than that emitted by a typical galaxy. An actively growing supermassive black hole or an intense burst of star formation is often invoked as the most likely source of the energy.